Don't let your work interfere with your workout! 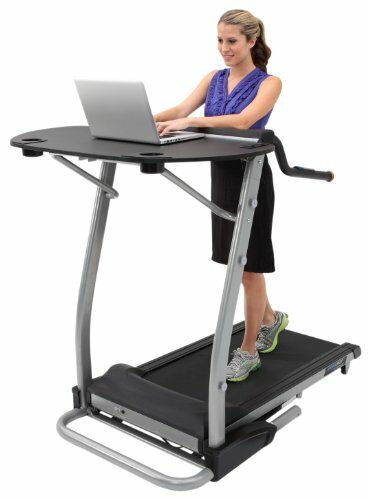 The Exerpeutic® 2000 "Workfit" high-capacity desk station treadmill combines both, letting you burn calories as you take care of business. The treadmill itself features extra-long safety handles and a power incline up to 15%, while the desk top has 2 cup/article holders, an AC outlet station, pre-drilled cord holes, and a foam arm support. It accommodates a keyboard, monitor, mouse and more! Extra long safety handles are 18-Inch long, more than 2 X the length of other typical treadmill handles. Tested up to 400-Pounds of user weight, built on a heavy duty reinforced frame. Motorized Incline adjustment range from 0 Percent to 15 Percent.